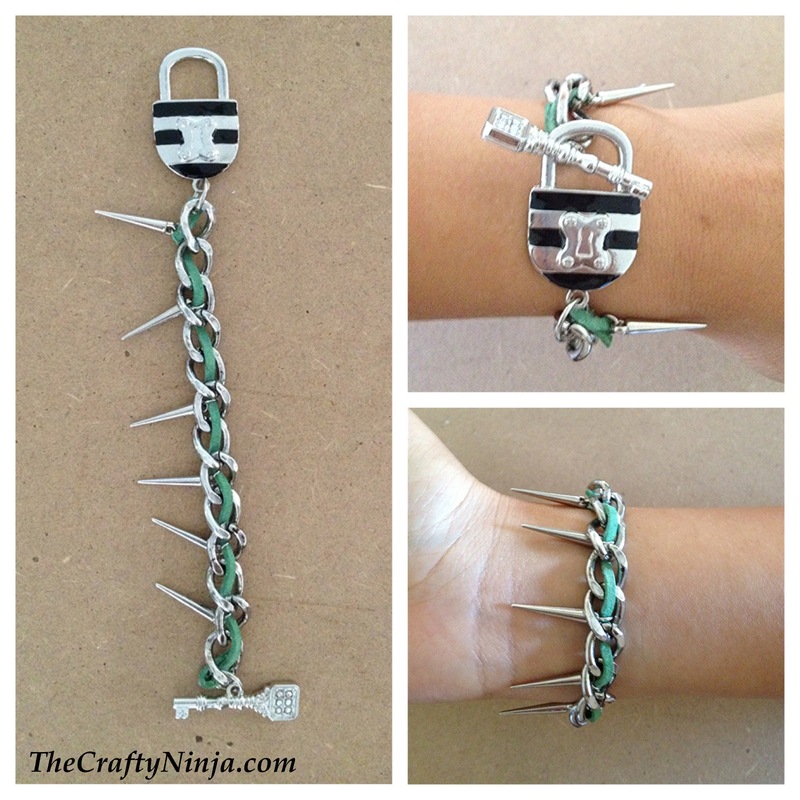 I had so much fun creating this DIY Spike Bracelet tutorial for Michaels.com for October Jewelry Month, check out my project on their website here. Today’s tutorial is from the Legends collection from Bead Landing, and I was inspired by the edgy feel of the accessories. I’ve been in love with the spike trend lately and its everywhere in fashion from jewelry, accessories, shoes, and apparel. 1. All the supplies were purchased at Michaels: Beads Landing Legends Spike Charms, Beads Landing Legends Lock and Key Closure Charm, Beads Landing 24 in. Chain, Beads Landing Leather Cording, Beads Landing 4 MM Jumpring, Beads Landing 12 MM Closure, E6000 Adhesive, Scissors, and Nipper Tool. 2 . Measure the Beads Landing 24 in. 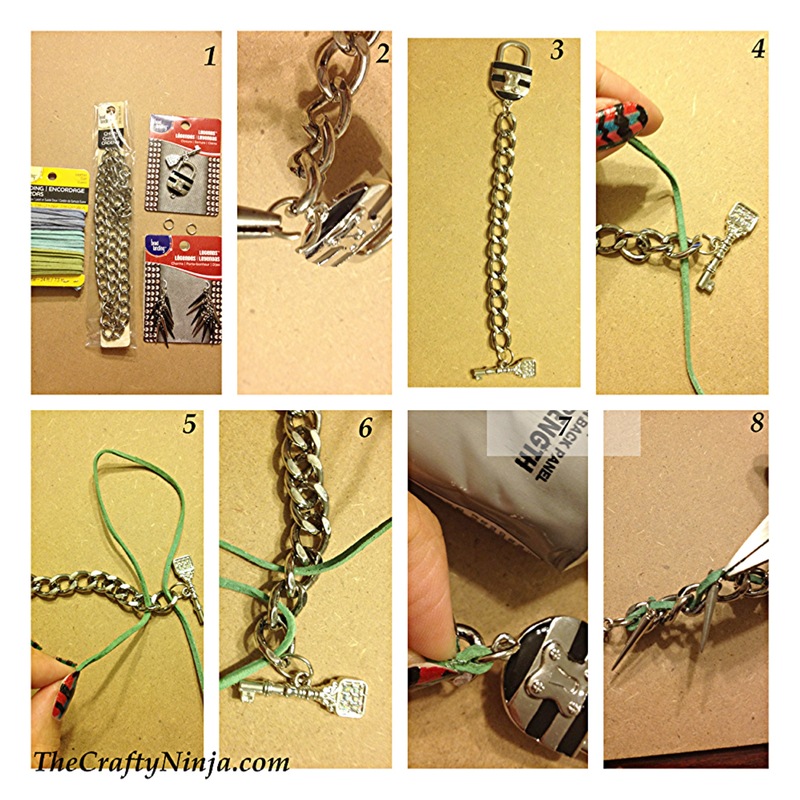 Chain around your wrist and cut with the Nipper Tool about one inch smaller. Attach the Beads Landing Legends Lock and Key Closure Charm with a Jumpring on each side of the chain. 3. What the bracelet will look like once it has the charms attached. 4. Take Beads Landing Leather Cording and pull through the first chain link. 5. In a weaving technique loop into the second chain link. 6. Repeat going over and under, weaving the leather cord through the chain links. 7. Cut the leather cord down to size. Fold over and glue with E6000. 8. Lastly attach the Beads Landing Legends Spike Charms to the leather cord every other link. Now your arm party is ready to wear in style!